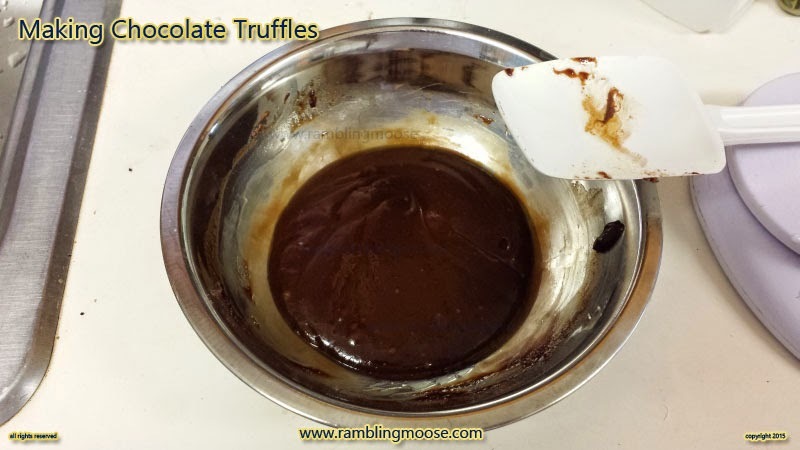 Usually the base recipe for chocolate truffles is simple. 2 parts chocolate, 1 part cream. Melt, form balls, chill, and serve. You can do that in the microwave. Just keep giving it 30 second pulses until it melts, stirring as you go on your way. I'm fussy. I use a double boiler or a Bain Marie. Just boil water in a sauce pan and float a larger bowl on top while stirring. Be careful though since chocolate melts at 86F. If you get too hot, it may scorch so do this slowly. 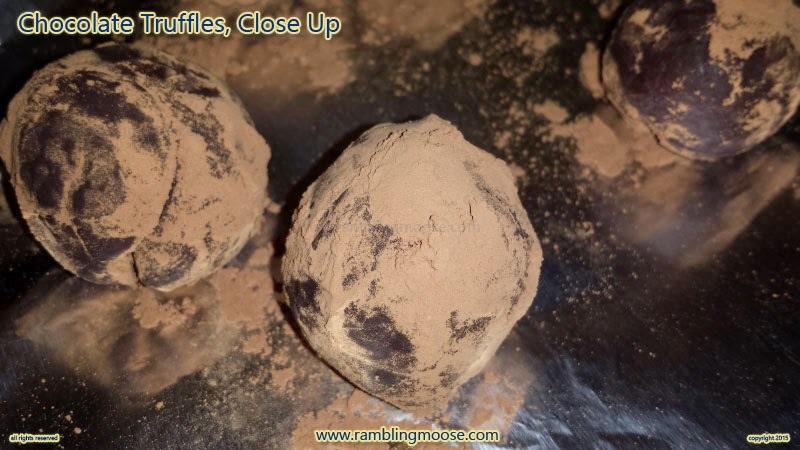 With chocolate truffles it takes only about 5 minutes to cook. Allow another 30 minutes until it firms up enough to form balls with a melon baller, then roll in nuts, cocoa, jimmies, or anything else your heart desires. This is a different recipe. It has Kahlua in it, so that changes what you have to mix in with the chocolate. Basically the idea is the same, 2 parts chocolate, 1 part "fat". In this case the "fat" is butter and Kahlua instead of cream. The Kahlua dilutes the butter down to the proper consistency and I ended up with a butter-like consistency truffle when I was done. I also wanted a small "right sized" serving for dessert. Tonight at the time of writing. It made five, which was fine for what I needed. Remember, since you're not actually "cooking", your chocolate quality directly effects how good your truffles will be. If you use "commodity" junk chocolate, you get what you paid for. Spring for the good stuff. I used some chocolate chips, and it was excellent! or anything else that you may prefer. Melt the Chocolate and Butter together in a bowl until the mix is smooth. This can be done using either the microwave on short bursts or in a Bain Marie water bath. When the Chocolate and Butter are melted, add in the Kahlua and mix until smooth. Remove from the heat and allow to cool for at least 30 minutes until firm. Form balls with the chilled truffle mixture and dredge through the toppings. Rack Says, Slow Down, The Lights Are Changing!